Not long ago, when a recipe called for mushrooms, it meant the white button variety. What else was there? Now, nearly every natural foods store, supermarket, and produce grocery offers a wide array of mushrooms. Mushroom lovers, you’ll find many tasty recipes on VegKitchen’s category of recipes featuring mushrooms. Shiitake, cremini, portabello and oyster mushrooms are among those that were once exotic but are now readily available. Their appearance, flavors, and textures aren’t all that make them so appealing. Whereas white mushrooms have scant to offer in terms of nutrition, the more exotic bunch have plenty of nutrients—notably B vitamins, potassium, and iron. A number of studies have bestowed medicinal qualities on them, as well—particularly the Asian varieties. Shiitake mushrooms, for instance, are believed to contribute to longevity, boost immunity, and help lower cholesterol levels. Oyster mushrooms have been found to cleanse the kidneys and stabilize blood pressure. Cancer-fighting and cholesterolo-lowering properties have likewise been ascribed to certain edible fungi. All this is good news, but the bottom line is that mushroom-maniacs incorporate them into meals because their earthy flavors, heady aromas, and sink-your-teeth-into-them textures add character to the simplest of dishes. Some mushroom varieties have become almost standard fare at the produce stand. Others, such as the more exotic Asian varieties, such as maitake and wood-ear, are still mainly available in dried form, as is the intensly-flavored porcini mushroom. With the burgeoning popularity of unusual mushrooms, it’s likely that we’ll be seeing more of these in fresh form in the years to come. BABY BELLA: These medium-sized, warm brown mushrooms are a smaller version of portabellos. They have a flavor that is deeper than white mushrooms, yet not quite as earthy as the larger kind. 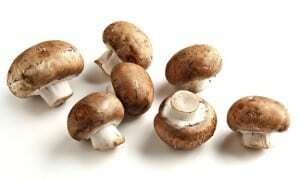 Use them as you would white mushrooms—in soups, stews, stir-fries, stuffed, broiled, or grilled. CREMINI (alternatively spelled crimini): Mild-flavored and light brown, these are a step away from white mushrooms, with the same size and shape, and a slightly more distinct flavor. Use as suggested above for baby bellas. ENOKI: With their long, slender stems and tiny caps, these delicate white mushrooms are wonderful to use raw in salads, or just briefly wilted to use in soups and stir-fries. MAITAKE: Mainly available in dried form, this ruffled, light brown Japanese mushroom has been shown to have anti-viral and immune-enhancing properties. Much of its use is currently medicinal and supplemental, but reconstituted maitake mushrooms may be used to make strong, tasty soups stocks or added to stir-fries and grain dishes. PORCINI: This dark mushroom has a rich, aromatic character that is often described as “meaty.” Considered a delicacy in Italian cuisine, where they are used fresh in risotto, sauces, and pasta dishes, porcini are more readily available in dried form. PORTABELLO: Once the exclusive domain of upscale restaurants, these are now widely available. You can buy the whole caps, which are about 3 to 4 inches in diameter, or sliced. These deep brown, earthy mushrooms are exceptional for grilling and broiling. Used whole, they make a delightful “burger.” Sliced and grilled, they’re wonderful tossed with baby greens and balsamic vinaigrette or used into hearty grain or pasta dishes. SHIITAKE: These earthy brown mushrooms have broad, thin caps with an pleasantly chewy texture. 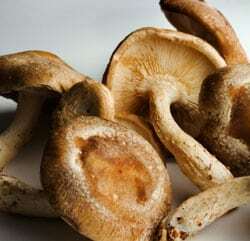 Among the most nutritious of mushrooms, they are commonly available both fresh and dried. Trim away the tough stems before use. Fresh shiitakes are delightful in Asian-style soups and stir-fries, as well as in vegetable sautees and pasta dishes. Dried shiitakes are most useful to impart flavor to soup stocks and sauces. OYSTER: These light-colored, ruffled mushrooms have a delicate flavor and texture. They are best used just briefly sauteed or broiled and are good in stir-fries, soups, and salads. WOOD-EAR (also known as tree-ear or cloud-ear): Mainly available in dried form, these thin, dark mushrooms get an exotic appearance from their fluted edges. The Chinese have traditionally associated this mushroom with longevity.Delicately flavored, almost bland, their appeal lies mainly in their chewy texture. They increase in size dramatically when reconstituted. Slice wood-ears and add to stir-fries, soups, noodle dishes, and rice dishes. Reconstituting dried mushrooms is easy. 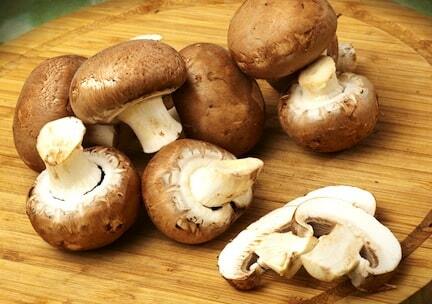 Simply place the mushrooms in a heatproof bowl and cover them with boiliing water. Shiitake and maitake take about 15 minutes to become pliable. Porcini take 15 to 20 minutes; wood-ears take 45 minutes to an hour. To make the mushrooms firmer and chewier, squeeze some of the liquid out of the caps before using. Use the soaking liquid in soup stocks or sauces, but make sure there is no sandy sediment. Get more by visiting VegKitchen’s Seasonal Produce Guides.